Versace Crystal Noir is a sumptuous fragrance, the olfactory equivalent of a long train on a fabulous evening dress. Multi faceted like a diamond, sensual and enticing, daring yet reassuring. 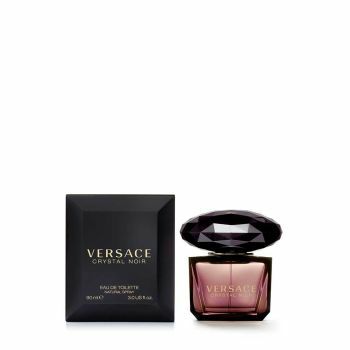 Versace Crystal Noir is a magical fragrance - ethereal yet carnal, an ultra feminine floral/oriental scent. Its olfactory pyramid is deliberately minimalist in order to enhance the intrinsic elegance of the ingredients. At its heart is fresh, crisp, fragrant gardenia that has been blended with amber that is purified almost to transparency for a sensuous and seductive result. It is a combination that creates a wonderful contradiction, like the two sides of every woman: sweet and sensual, earthy and sophisticated.